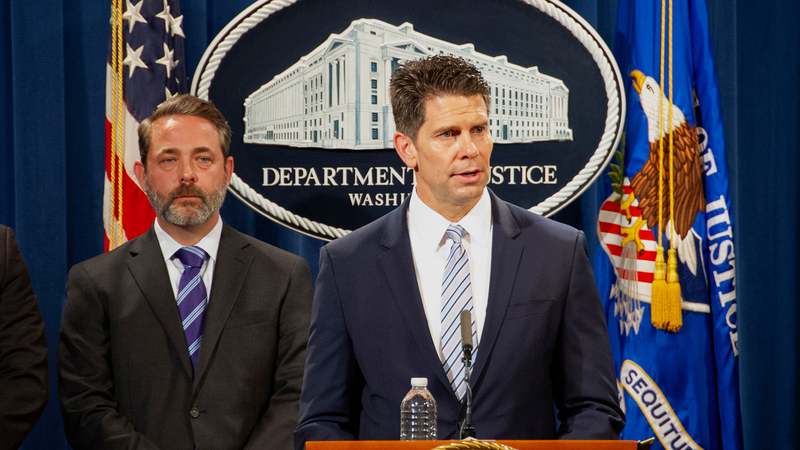 FBI Deputy Director David Bowdich speaks during a press conference with other federal officials to announce the results of this year's national health care fraud and opioid takedown by the Medicare Fraud Strike Force. Shown behind Bowdich is Department of Health and Human Services Deputy Inspector General for Investigations Gary Cantrell. Another focus of the operation was medical professionals allegedly involved in the unlawful distribution of opioids and other prescription narcotics. Because virtually every health care fraud scheme requires a corrupt medical professional to be involved in order for Medicare or Medicaid to pay the fraudulent claims, aggressively pursuing these corrupt professionals not only has a deterrent effect on other medical professionals who might be tempted but also ensures that their licenses can no longer be used to bilk the system. Among those charged in this operation were 165 doctors, nurses, and other licensed medical professionals. “These schemes harm every person who pays for health care benefits, from the patient who doesn’t get the care they need to the business that pays higher insurance costs to cover their employees, and every taxpayer who funds Medicare and Medicaid,” said Bowdich about the impact of health care fraud. In addition to the criminal charges announced today, federal authorities are aggressively pursuing civil remedies to recover fraudulently obtained health care program funds and to suspend and/or exclude corrupt providers and medical professionals from participating in federal health care programs. June marks the third anniversary of the Hostage Recovery Fusion Cell, a multi-agency team whose mission is to recover American hostages and support families whose loved ones are being held captive abroad.